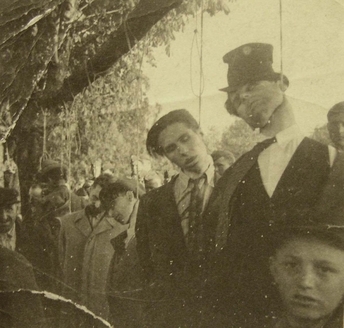 German executions in Pancevo, Serbia. These are usually identified as killings of civilians. There also is an argument that these are partisans. 22 April 1941 (Photographer: Gerhard Gronefeld). 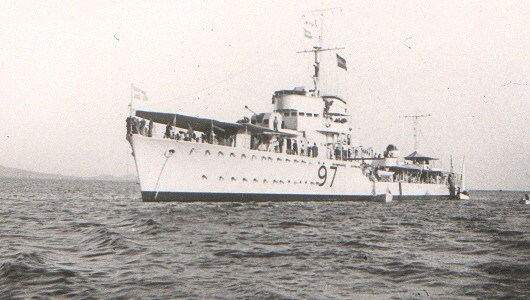 Operation Marita: The Greek government, including King George, departs from Greece on 22 April 1941 aboard Greek destroyer Vasilissa Olga, bound for Suda Bay. The Germans begin absorbing their conquests in the Balkans by creating the Territory of the Military Commander in Serbia. 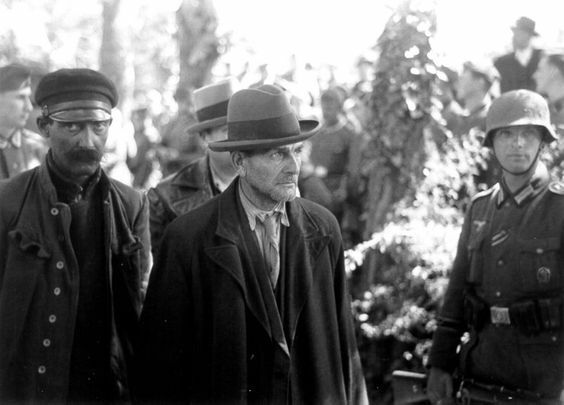 The Italians remain violently upset that they have been excluded from the surrender of Greek forces in Albania. In fact, they open an offensive on the Epirus front, where the Greeks fight back and, following the established pattern, give little ground and inflict heavy casualties on the Italian attackers. Hitler - conflicted between his roles of military warlord and statesman - tries to placate Mussolini. He has his military headquarters (OKW) rush a draft of the surrender terms to Rome to "keep Italy in the loop." Mussolini, however, loudly proclaims that Italy could have defeated Greece by itself and demands to be included in the setting of any surrender terms. After looking over the OKW agreement, he objects to provisions allowing Greek officers to keep their sidearms because they have humiliated the Italian troops. The Germans - meaning Hitler - reject Mussolini's quibbles on that one score, but basically give him everything else that he wants. This includes handing over the entire Yugoslav and Greek navies to Italy (which admittedly are not that large). A surrender conference begins late in the day at Salonika (Thessaloniki). The Germans agree to an Italian demand that Axis troops stage a ceremonial entry into Athens with German and Italian troops marching side-by-side. The Italians - meaning Mussolini - also demand that the Greeks offer to surrender to them on the Epirus front before they will sign any surrender documents. The Germans are uncertain how to respond to this - Hitler briefly considers letting the Italians fight on - but the Greeks agree to surrender to Mussolini's generals as well as the German ones. In the execution of this policy you will no doubt not worry about vehicles or stores, but get the men away. We can re-arm them later. The main problem for the Allied troops in Greece is that their left flank was supposed to be defended by Greek troops, but the Greek Army for all intents and purposes has been prevented from doing that. The campaign is turning into a race for the ports that the British can use to evacuate their troops, with the Germans hurrying toward the Gulf of Patras in order to cross over to the Peloponnese and shut off escape routes there. The New Zealand 4th Infantry Brigade begins the withdrawals from the Thermopylae Line. The British 1st Armoured Brigade also heads south towards Athens. The RAF withdraws its last fighters from Athens to a base at Argos further south. 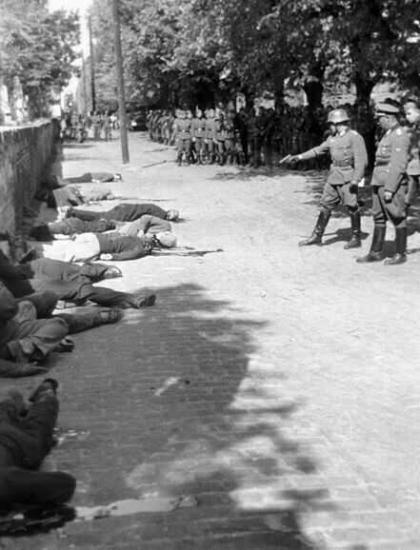 Another view of the Pancevo Massacre of 21-22 April 1941. The Luftwaffe engages in major raids throughout the Aegean against Allied shipping and sinks numerous ships throughout the region, almost all Greek ships. With the Wehrmacht grinding forward on the mainland, the Luftwaffe aims to cut off the British escape route to Crete and Alexandria. There also are several ships damaged. Greek freighter "Macedonia" being bombed and sunk by Junkers Ju 87 dive bombers at Spilia Phocidos (George Karelas, via ww2wrecks). The Luftwaffe bombs and damages two Royal Navy ships, cruiser HMS York and netlayer Protector, at Suda Bay. The two ships are hit while attending to beached heavy cruiser York (being used for antiaircraft defense). A lighter (A.16) is lost as a result of this bombing. The Luftwaffe bombs and near-misses 1054 ton Greek tanker Theodora off Antikyra, Gulf of Corinth. There are twelve deaths. The Theodora is moored next to tanker Thedol 2 and catches fire from the burning Thedol 2, causing the Theodora to sink also. The Luftwaffe bombs and damages Greek destroyer Leon in Suda Bay, Crete. 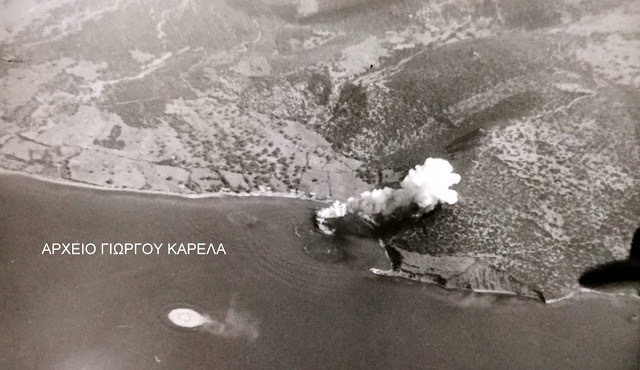 The Luftwaffe bombs and damages 2747 ton Greek freighter Teti in the Gulf of Corinth. The master beaches it to prevent sinking. Yugoslavian torpedo boats Kajmakcalan and Durmitor make it to Suda Bay. Yugoslavian 4294 ton freighter Serafin Topic is interned at Oran, Algeria for use by the Italians. The Italians seize 5387 ton Yugoslavian freighter Tomislav at Shanghai. The Italians rename it Venezia Giulia for their own use. Convoy AG 13 departs from Alexandria bound for Suda Bay. This is the genesis of Operation Demon, the evacuation of British forces from Greece, though that operation technically does not begin for another couple of days. The ships of Convoy AG 13 will take off some of the British troops on the mainland. Convoy ANF 29 departs from Alexandria bound for Suda Bay. 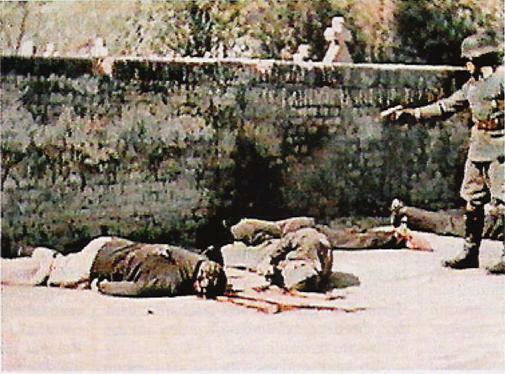 Another view of the executions on 22 April 1941 in Pancevo, Serbia. This is a still from a color film taken by Gottfried Kessel of the Gross Deutschland Regiment's film squad. Iraq War: Tensions are simmering in Iraq. The British hold several bases, including the port of Basra and the airfield at Habbaniyah, while the pro-Axis government of Rashid Ali controls the rest of the country. The Iraqis surround the British base at Habbaniyah. They also cut some oil pipelines. As yet, despite demands from both sides to the other to abandon their positions, there has been no fighting. KG 55, which carries out the raid, loses two bombers. Churchill sends Air Chief Marshal Sir Charles Portal a memorandum noting that the US will soon "bombard" (not perhaps the most apt word choice) the RAF with a "very great mass of aircraft." He suggests that Portal "start another 10 Squadrons and cut into this surplus of Spitfires and Hurricanes." As he concedes in the memo, however, the real bottleneck for the RAF's expansion is not planes, but pilots. During the day, RAF Bomber Command sends 14 planes on coastal sweeps off southern Norway. After dark, RAF Bomber Command raids Brest with 26 aircraft. East African Campaign: The 1st South African Brigade troops in Abyssinia Take Camboicia Pass. They make 1200 Italian troops (mainly natives) prisoner. This is a major step on the road to Dessie, one of the main Italian strongholds in the country. 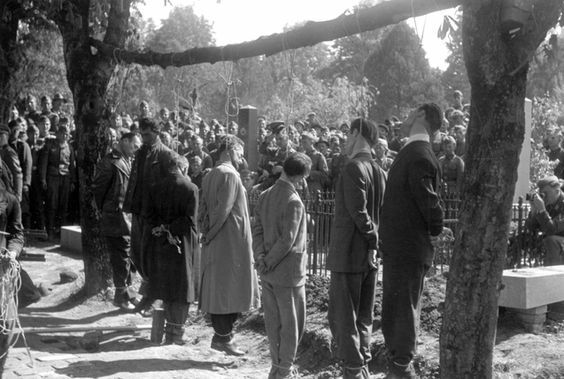 Victims of the Pancevo Massacre, 22 April 1941. Battle of the Atlantic: The Luftwaffe bombs and sinks 364 ton salvage ship Miss Elaine at Plymouth. The Miss Elaine is later raised and repaired. The Luftwaffe bombs and damages 5225 ton British freighter Antonio off Tyne. The ship makes it to Shields under tow. The Luftwaffe bombs and damages 391 ton British freighter Croham at Peterhead. British 87 ton steam barge Coronation of Leeds hits a mine and sinks off Thames Haven. All three on board perish. Part of the barge is later salvaged. German 551 ton freighter Obra hits a mine and sinks off Greifswald. Convoy OB 313 departs from Liverpool. Royal Navy anti-submarine warfare trawler HMS Tango (T 146, Lt. John Hunter) is commissioned. Australian minesweeper HMAS Geelong is launched. US destroyer USS Wilkes (DD 441, Lt. Commander John D. Kelsey) is commissioned. If this consignment gets through the hazards of the passage, which, of course, cannot be guaranteed, the boot will be on the other leg and no German should remain in Cyrenaica by the end of the month of June. Of course, the Germans continue to reinforce their troops in Libya, too, with elements of several units of Infantry Regiment 19 arriving. An arms race is developing in North Africa with a very uncertain outcome. Churchill also memos CIGS Sir John Dill, stating that it is the War Office's estimation that the the British/Australian Tobruk defenders "are four or five times as strong as the besiegers," adding somewhat characteristically that "some of them are Italians." The War Office estimates that there are 4500 Axis troops besieging Tobruk. Visiting Australian Prime Minister Menzies notes in his diary that "Bombardment of Tripoli not, I think, a great success, but some damage done." Skirmishing continues on the Tobruk perimeter, with the Allied troops focusing on the Italian troops. At dawn, the British send armored vehicles against the 5th Light Division. Australian soldiers of the 2/48th Battalion, including three tanks and 25-pounder artillery, mount a raid southwest of Ras el Medauar. The Fabris detachment holding a hillock there loses 370 men as prisoners and 2-4 guns. A company of the 2/23rd Battalion advance toward Derna and takes about 100 prisoners of the Italian 27th Infantry Division "Brescia." The German war units note, "The Italians are surrendering." The Luftwaffe bombards Tobruk with about 30 Junkers Ju 87 Stukas. Lieutenant General Erwin Rommel (who is awarded the Gold Medal of Military Valor in Silver today) drives to Acroma to assess the situation. He orders the Italian Trento Division to take over for the mauled Fabris detachment. The report notes (apparently based on Rommel's inspection) that the Italian troops simply abandoned their guns and other equipment "undamaged" when surrendering and did not even take out their breechblocks. It is standard procedure in all armies to disable artillery when abandoning it to take out the breechblocks. Rommel continues to assemble his forces for his forces for a massive set-piece battle to take Tobruk. The 15th Panzer Division continues to assemble in Tripoli, and the Allied attempts to break out of Tobruk give him a sense of urgency to move his troops across Libya for that purpose. Australian Private Ron Daniels, gunner on a Bren-gun carrier, continues firing after his commander, Sergeant Len Batty, is wounded during one of the morning skirmishes. Daniels himself also is wounded and receives the Military Medal for his heroism. Around 20:30, the Luftwaffe sends a very large air raid after dark on Valletta, the surrounding area, and RAF airfields. The attack destroys 40 homes and kills about six people. The attack is very professional, with pathfinders dropping flares on a moonless night. The Luftwaffe escapes without loss. War of the Pacific: The ABD Conference continues in Singapore to develop a coordinated plan in case of Japanese attacks. Participating are military officials from Great Britain, the Netherlands (who control powerful naval forces in the Dutch East Indies) and the United States. The British are nonplussed by the low-level participants that the United States has sent. War Crimes: The Luftwaffe (Junkers Ju 87 Stukas) bombs and holes British hospital ship Vita off Tobruk. The ship sinks after destroyer HMAS Waterhen takes off 486 people (including 6 nurses). The Luftwaffe also bombs and sinks 1134 ton Greek hospital ship Sokratis off Antikyra, Gulf of Corinth. Why exactly half were hung and the others shot is unclear. The names of those hung: Milanović Milan, Milivojevic Milutin, Cadik Jacob, Koceš Franja, Caran Milorad, Azick Pera, Mirđić George, Žestić Vladimir, Maxine Jovan, Topolovački Alexander, Skovran Mirko Ristic, Ljubomir Jeftic Milenko, Adamović Jovan Stojkov Dusan, Radak Kosta, Cosic Taja, Šiškulović Darinka (all from Pancevo, except for Milivojevic, who was from Omoljica near Pancevo). The names of those shot: Humanović Tihomir, Grobanović Ivan, Tešanović Gojko, Pantelić Sava, Hadžić Dušan, Grujuć Đura, Haker Šandor, Markov Toma, Perić Steva, Crni Đura, Novak Marijan, Milenković Dragutin, Nedić Pera, Dimković Tihomir, Atanacković Draga, Atanacković Radivoj, Avramov Vasa, Pinter Stevan (All from Pancevo). Beyond that, historians disagree. The incident was meticulously documents by filmmaker Gottfried Kessel of the Grossdeutschland Division and photographer Gerhard Gronefeld. Some claim that it was pure butchery by the Germans. Others claim that the Germans executed armed partisans after a lawful (if extremely brief) trial presided over by a SS man, SS-Sturmbannführer Rudolf Hoffmann of the SS Das Reich Division. Allegedly, the partisans had been firing on the Wehrmacht soldiers and were executed according to the norms of international law. Drawing any firm conclusions as to guilt or legality is impossible. Going beyond these sketchy facts is dangerous and involves assumptions. The only firm conclusion is that the incident happened, and about 36 people died by hanging or firing squad. There are streets named after two of the people killed, Vladimir Žestić and Jovan Maksin. Otherwise, the massacre has received little notice, then or now. A perfunctory German investigation after the war by state attorneys in Munich and Darmstadt allegedly was closed without any charges being brought. Beyond that, everything is speculation or disputed evidence. But... something bad happened in Pancevo. German/Soviet Relations: The Soviets lodge a diplomatic protest with Germany over German overflights of Soviet territory. They complain that there have been 80 such incidents during the period 27 March 1941 - 18 April 1941. Among the proofs offered are a downed Luftwaffe reconnaissance plane complete with maps of the Soviet Union and rolls of exposed film. US Military: Congress raises the authorized enlisted strength of the US Navy and Marine Corps. The Navy is allocated 232,000 men, with the Marine Corps strength set at 1/5 of the Navy's. Greek destroyer Hydra, sunk today by the Luftwaffe. German Military: Admiral Erich Raeder meets with Adolf Hitler to discuss provocative US Navy conduct. Australian Government: Menzies refers cryptically in his diary to "malcontents" back home in Australia. Churchill calls Menzies and remonstrates with him about negative press commentary about the war situation emanating from Australia. We should not confuse deliberation with procrastination just as the Tripartite Pact does not affect the relations of the Three Powers vis the Soviets so that the Soviet-Japanese Neutrality Pact and the declaration do not affect in the least the Tripartite Pact which remains the immutable basis of our foreign policy. China: The Japanese occupy Fuzhou, Fujian Province, directly across from Taiwan and south of Shanghai. American Homefront: Thomas H. Beck, Chairman of the Board of Crowell-Collier Publishing Company, submits to President Roosevelt a proposal for organization of a private air force. Beck's submission advocates a course of pre-flight instruction for men interested in the air force. This is a key step in the formation of the Civil Air Patrol (CAP), which is designed to be an Auxiliary of the US Army Air Corps. 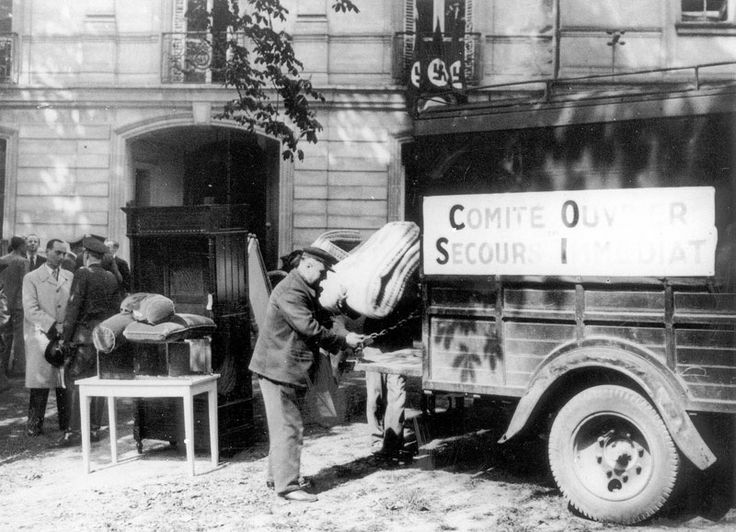 The Vichy “Workers’ Committee for Immediate Relief” (Comité ouvrier de secours immédiat) confiscates Jewish property. Paris, 22 April 1941.